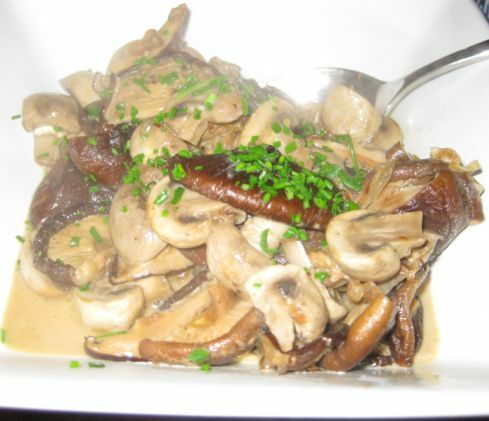 Cooking duck can sometimes be intimidating, but it is actually as easy as cooking chicken. The secret is to be patient and allow the fat to render slowly while the skin becomes crisp. 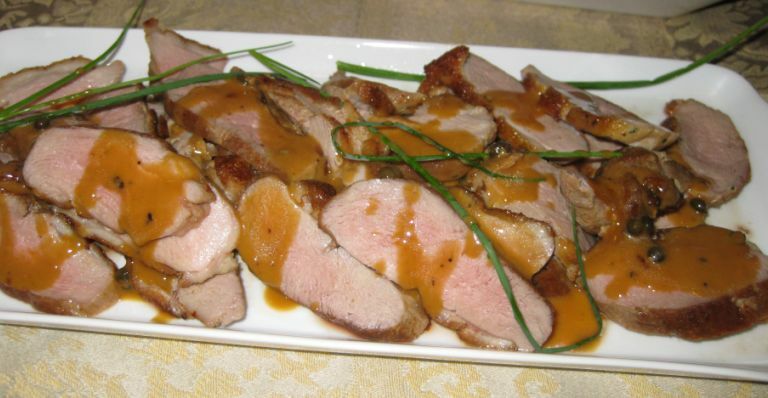 If you can’t find duck breasts, just remove the breasts from whole ducks (available in Asian grocery stores) and use the legs and thighs for another preparation. 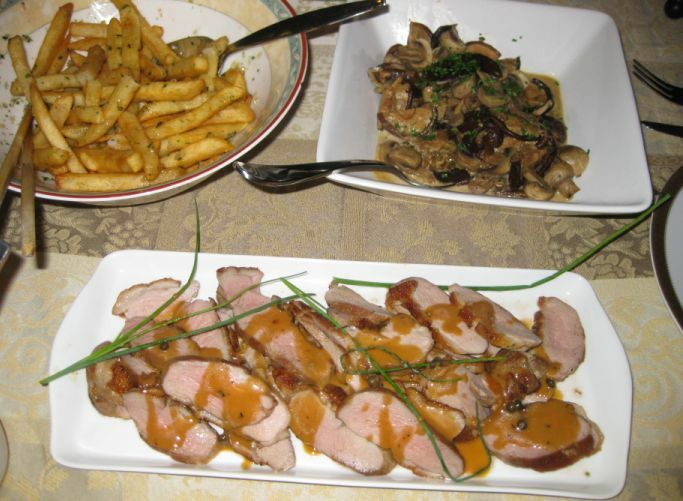 Pan Seared Duck breasts in green peppercorn sauce (Magret de Canard au poivre vert) is a classic French dish and it is usually paired with crispy French Fries. 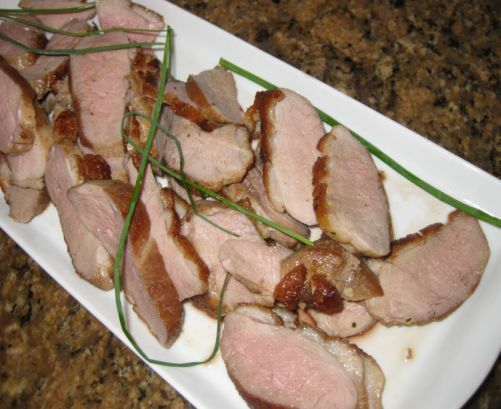 I like my duck to be medium rare but Hoa and Kevin like their duck to be cooked (a point) so I decided to cook to meat a little longer. 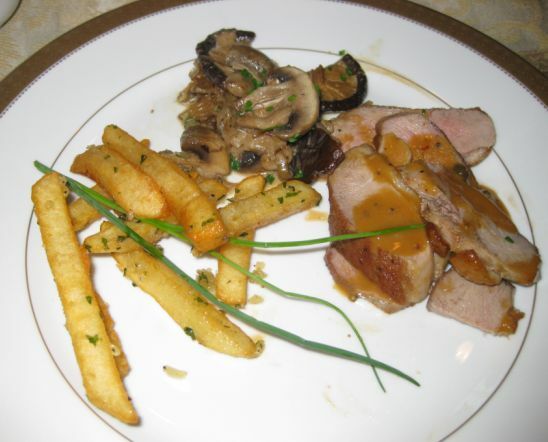 Tonight I paired the pan seared duck breast with a green pepper sauce and served it with garlic French fries and sautéed mixed mushrooms. 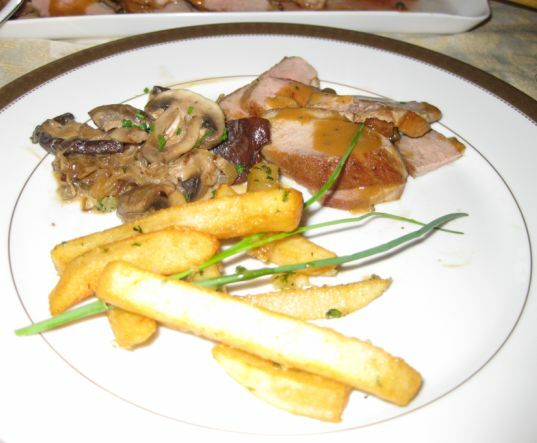 Family style dinner with a dish of pan seared duck breast, sautéed mixed mushrooms and garlic French Fries. 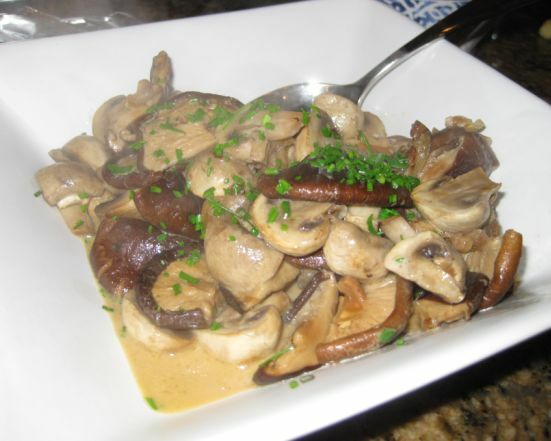 Today is actually Mother's day but I opted to cook tonight because going out on this day is so hectic! 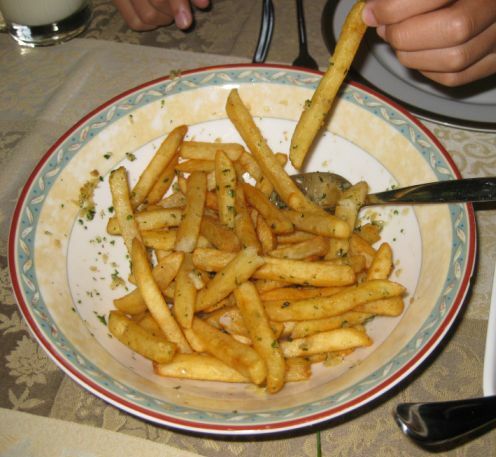 restaurants are usually so crowded that service on this day is always pretty bad. Kevin and Hoa were pretty happy to have a great meal at home...I'll take a rain check and we will go out to dinner another time! 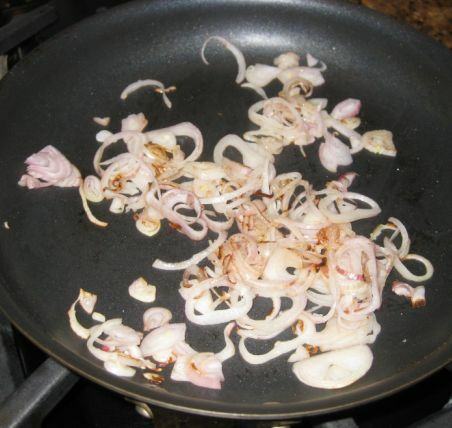 Shallots are cut thinly sliced and then sautéed until they are caramelized. 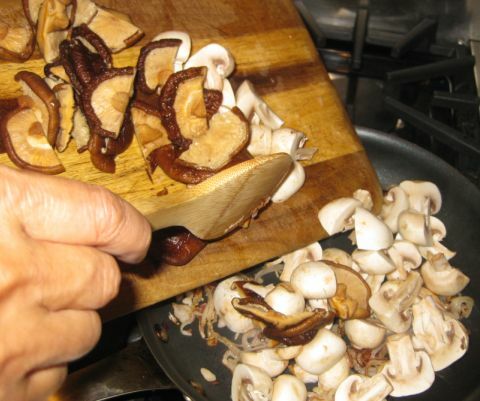 Adding button and shitake mushrooms to the pan . 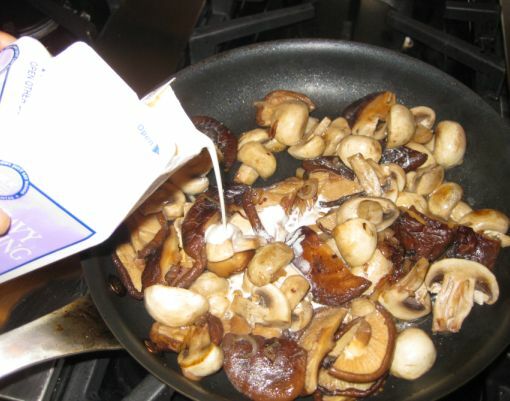 When the mushrooms are soft and have released all their juices, heavy cream is added. The dish is done and a few sprinkles of chives is added to give it a nice little contrast. 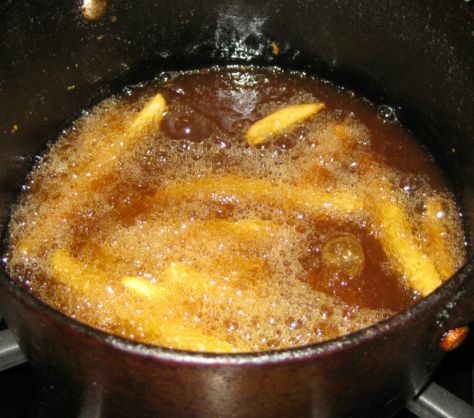 Here I am frying the French Fries. 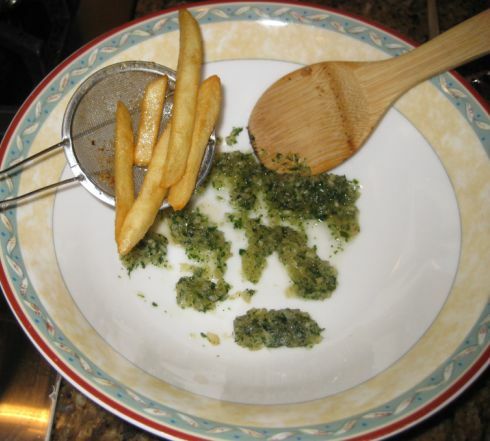 When the French are done I am mixing it with fresh garlic, butter and parsley mixture. The duck breasts are pan fried and they are now on a plane and need to rest for about 5/10 minutes so the juice can be redistributed before I can slice them. After resting for about 10 minutes I cut the breasts into slices... all I need to do is to add the sauce au poivre et voila it is ready to be served.